Science on Tap with Ron Magill of Zoo Miami – Due South Brewing Co. This event is 21+. Please arrive early to secure a seat and a brew! Modeled after “Science Cafes”, Science on Tap is the only place in Palm Beach County where for the price of a cup of coffee, a quality craft beer, or a smooth glass of wine, anyone can come to discuss the latest trends in science and technology with a world-class scientist. With a motto to ‘drink up – get smart,’ you know you are in for a casual-education session, as the goal of the program is for guests to have fun while learning a little bit more about everyday curiosities. No ticket required — Admission is FREE! Seating is limited, please arrive early. Presentation starts @ 7pm and runs 30min. plus Q-n-A after. Food and beverages are available for purchase. 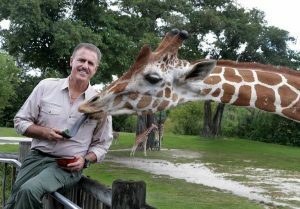 About the presenter: Ron has worked with wildlife for over 35 years and has had the privilege of having “hands-on” experience with a tremendous variety of animals. As Zoo Miami’s “Goodwill Ambassador”, he has made frequent television appearances on many programs including, “National Geographic Explorer”, the Discovery Networks, the “Today Show”, “Good Morning America”, “The Late Show ”, “CBS’ This Morning”, “Dateline” and “CNN”. Ron has also been a regular guest on several Spanish language television programs including international hits “Sabado Gigante” and “Despierta America”. In addition, he has written and produced many wildlife articles and award-winning photographs that have appeared in publications and galleries around the world. He has traveled extensively throughout Africa, India and Tropical America while developing and directing conservation projects and Emmy Award winning documentaries focusing on the wildlife of those regions. If you know a local scientist or technologist that is interested in presenting at Science on Tap, email events@sfsciencecenter.org.